Why spend hours slaving away in the kitchen? The Washington, D.C. area has several restaurants and gourmet food shops that offer a complete Thanksgiving turkey dinner to go. You can pick up delicious dishes professionally prepared and spend the day with your guests, not stuck in the kitchen. Most locations require you to reserve your meal in advance. Pre-order turkey and all the trimmings from the popular restaurant specializing in Southern hospitality. The to-go package includes your choice of oven-roasted turkey, baked mac and cheese, bourbon pecan pie, pumpkin pie, collard greens, brussels sprouts, Carolina gumbo, cornbread stuffing, cranberry sauce, mashed potatoes, and homemade cornbread sticks with peach butter. Order a full Thanksgiving feast to go. A variety of gourmet dishes are available, such as fresh turkey or spiral cut honey ham, butternut squash soup, BlackSalt clam chowder, half-shell oysters, jumbo cocktail shrimp, cornbread, buttermilk biscuits, southern greens with house-smoked bacon, caramelized brussels sprouts, herb-roasted rub beets, and apple streusel. Three-star feast to-go (feeds six to eight people) includes a 10- to 12-pound free-range roasted turkey, two freshly baked breads, four traditional sides from the award-winning restaurant’s menu and a pumpkin or apple pie. The menu also includes wood oven-roasted bone marrow, jumbo lump crab cakes, spiced halibut, veggie pot pie, and slow-cooked prime rib. As for the sides: pimento mac and cheese, butter-whipped potato, and roast sugar pumpkin round out the meal. The Washington, D.C. outpost of this legendary family-style Italian restaurant offers a hearty feast with all the trimmings (serves six to eight people). Eat in the restaurant or have it delivered. The menu includes an 18-pound roast turkey with sausage and sage stuffing, homemade cranberry sauce, brussels sprouts with caramelized onions and applewood smoked bacon, sautéed string beans, baby carrots, sweet potato casserole, mashed potatoes and gravy, as well as your choice of pumpkin, apple or pecan pie. Thanksgiving pick-up service is available at Hill Country. The menu features turkeys brined, rubbed with Hill Country’s signature spice blend, and smoked low and slow for that classic holiday flavor with a Texan twist. A Thanksgiving feast for eight to ten people includes a whole pit-smoked turkey (14 to 16 pounds), cornbread with ancho-honey butter, four sides (64oz. each), and two pies, similar offering for five to eight people. Meats, sides, and desserts can be purchased separately for carryout. There are three Balduccis locations in the D.C. area, in Bethesda, Alexandria, and McLean. The Thanksgiving menu showcases traditional turkey and a selection of modern side dishes (like butternut squash lasagna) and desserts. You can also order starters like asparagus roll-ups, stuffed mushrooms, and lobster bisque. 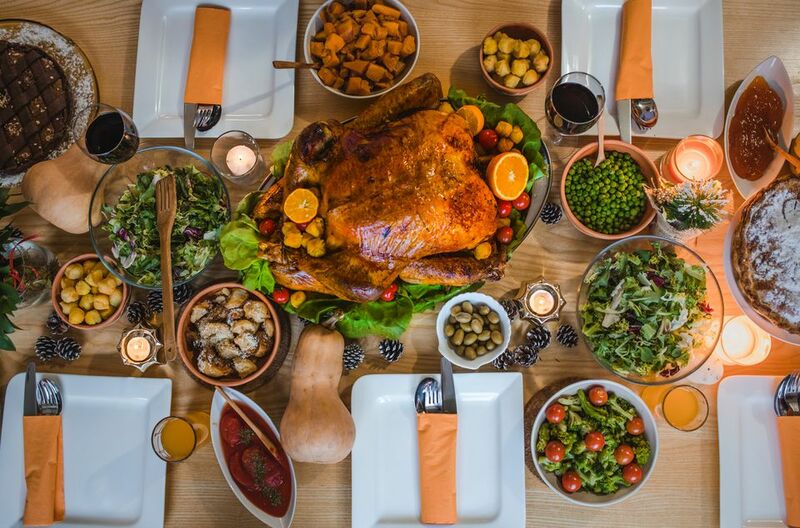 Thanksgiving meals catered for families can serve up to eight people and include oven-roasted turkey breast, cranberry apple cornbread stuffing, creamy wild mushroom sauce, mashed potatoes, sourdough breadsticks, plus your choice of two desserts. HoneyBaked Ham has many locations in Maryland and Virginia. Known for their cooked hams, during the holiday season, you can also order a fully-cooked whole turkey, oven-roasted or smoked. There are many different sizes and selections of meals to choose from depending on your Thanksgiving party. Most feasts come with an oven-roasted whole turkey, country cornbread stuffing, maple sweet potato souffle, roasted turkey gravy, and a southern pecan pie. The popular grocery store offers a wide range of holiday fixings for small and large parties. Local locations include Germantown, Columbia, Frederick, Crofton, Fairfax, Sterling, Woodbridge, and Leesburg. There are tons of Safeway grocery stores throughout the Washington, D.C. area. Safeway offers several different heat and serves turkey dinners with side dishes and desserts. Similarly, Whole Foods Market has locations throughout the Washington, D.C. area. The organic food store offers complete Thanksgiving dinners with an organic turkey with the traditional trimmings stuffing, mashed potatoes, gravy, and cranberry sauce. Orders can be placed in person at each store, over the phone, or online. Enjoy a home-cooked turkey or prime rib dinner with all the fixings—butternut squash soup, whipped potatoes, herbed roasted vegetables, and seafood pasta salad with goat cheese. Sweet treats for you to take home include your choice of apple, pumpkin, or pecan pie. Each meal serves six. Orders must be received by the Monday before Thanksgiving. There is also a Thanksgiving Day Brunch available for guests and anyone who wants to eat in the restaurant. Texas Jacks' take-home catering menu features their barbecue classics. Choose from two packages, one serving five to nine guests featuring a 14-16 lb. smoked turkey, three 32 oz. sides, and one 10-inch pie, or the ten to twelve guest package featuring a 14-16 lb. smoked turkey, three 62 oz. sides, and two 10-inch pies. Quantities are limited.